The Bills moved Jones (neck) to injured reserve Wednesday, Chris Brown of the team's official site reports. Analysis: Jones hadn't played since Oct. 14 due to the neck injury and didn't seem to be making much progress in his recovery, as he failed to practice in any capacity prior to the Bills' Week 8 loss to the Patriots. The transaction opens up a roster spot for quarterback Matt Barkley, who was signed to a one-year deal to provide added insurance behind Nathan Peterman while Josh Allen (shoulder) and Derek Anderson (concussion) tend to injuries. Jones (neck) will not play in Monday's matchup with the Patriots, Matthew Fairburn of The Athletic reports. Jones (neck) didn't practice Thursday, Chris Brown of the Bills' official site reports. Analysis: Jones originally suffered a neck injury in Week 6 against the Texans, and was unable to suit up in Week 7. His status for Week 8 is still up in the air, but this news certainly doesn't bode well for his return to the field. If Jones is unable to suit up in Week 8, Marcus Murphy would likely continue to assume his role on special teams and provide depth at running back. Jones won't play Sunday against the Colts due to a neck injury, Mike Rodak of ESPN.com reports. Analysis: It wasn't previously known why Jones was unable to practice, but the Bills finally revealed the source of the running back's discomfort in addition to ruling him out. The extent of Jones' setback isn't certain, however, so it remains to be seen if he'll miss any additional action beyond this week. Marcus Murphy might be asked to suit up this week and take on Jones' roles on special teams and as a depth running back. Jones (undisclosed) didn't practice Wednesday, Chris Brown of the Bills' official site reports. Analysis: Jones is considered week-to-week after suffering the unspecified injury during Sunday's loss to the Texans. It remains to be seen whether Jones will suit up against the Colts in Week 7, but if Buffalo's special teams captain remains sidelined for any amount of time, it's possible that fellow depth back Marcus Murphy could serve as the team's primary kickoff and punt returner. Jones is week-to-week with an undisclosed injury suffered during Sunday's loss to the Texans, Chris Brown of the Bills' official sitereports. Analysis: Jones is a strong special teams player, but as a depth player and with the Bills having other options in the return game, his loss wouldn't be that big of a hit to a team that has much bigger problems trying to figure out the current mess of a quarterback situation. Jones (head) is active Sunday against the Vikings. Analysis: Jones will make the active roster Week 3 despite logging limited practices all week due to a head injury that wasn't ruled a concussion. He's been primarily a special teams player all season, having yet to record an offensive snap. There's a slight chance that changes this week with LeSean McCoy (ribs) inactive, though Chris Ivory and Marcus Murphy are expected to lead the Buffalo rushing attack. Jones (head) practiced on a limited basis for the third straight day Friday and is listed as questionable for Sunday's game in Minnesota, the Bills' official site reports. Analysis: Jones did not suffer a concussion, even though he took a nasty and bloody hit last week, so it seems like he'll be able to play through the cuts and scrapes come Sunday. If he's scratched, it would have just as much to do with LeSean McCoy (ribs) suiting up and the Bills trying to use their depth at other positions. Jones (head) practiced on a limited basis for the second straight day Thursday, the Bills' official site reports. Analysis: Jones surprisingly didn't get concussed on a Week 2 hit where he took a licking after his helmet had already fallen off on the play. It looks like the veteran and special-teams stud will keep on ticking even though he's scraped up. The Bills could use some extra depth at running back this week, given that LeSean McCoy will be playing at less than 100 percent, if he plays at all. 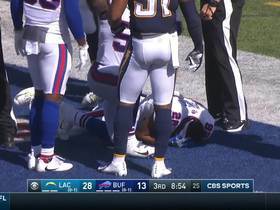 Coach Sean McDermott said Monday that Jones did not suffer a concussion during Sunday's loss to the Chargers and had his head "bruised and cut up" from taking a hit after his helmet had previously fallen off, Chris Brown of the Bills' official site reports. Analysis: Jones doesn't factor much into the offense, but he is a strong special teams player. Moreover, with LeSean McCoy (ribs) in pain and perhaps limited heading into Week 3, it'd help the team and the running back depth if Jones can suit up this week against Minnesota. Jones is questionable to return to Sunday's game against the Chargers due to a head injury, Mike Rodak of ESPN.com reports. Analysis: As long as Jones remains sidelined, Marcus Murphy will serve as Buffalo's primary kick returner. The severity of Jones' injury has yet to be disclosed, so expect an update after Sunday's game concludes. With Ray-Ray McCloud listed as out for Sunday's opener, Jones is expected to serve as the primary kickoff return man, Chris Brown of the Bills' official site reports. Analysis: This is likely the reason Jones made the final roster over Travaris Cadet, though it's doubtful Jones will see any running back carries. 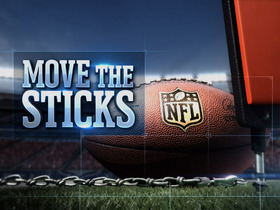 Additionally, he may not see an abundance of return opportunities with Justin Tucker doing the kicking for the Ravens. Jones (arm) and Travaris Cadet served as the Bills' kickoff returners during June minicamp, Joe Buscaglia of WKBW.com reports. Analysis: A career special teamer, Jones returned two kicks for 50 yards in eight games with Buffalo last season before a broken arm ended his campaign in early November. He re-signed with the Bills in March and is now expected to compete with Cadet, Marcus Murphy and Keith Ford for what likely will be two roster spots. LeSean McCoy and Chris Ivory appear locked in atop the depth chart at running back. Jones (arm) is re-signing with the Bills. Analysis: Jones played 128 snaps on special teams and only three on offense in eight games for the Bills last season before a broken arm landed him on injured reserve. While unlikely to be part of the equation in the backfield, his contributions on special teams could help him stick around the roster as the No. 4 running back. Jones figures to recover from the broken arm before training camp, if he hasn't already. 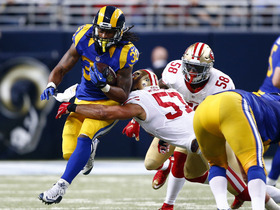 Jones (arm) was placed on injured reserve Saturday, Joe Buscaglia of 7 ABC Buffalo reports. Analysis: Unsurprisingly, Jones has been placed on IR after being lost for the season due to a broken arm. As a result, the Bills signed Travaris Cadet, who most recently played for the Jets, to bolster their backfield. Bills head coach Sean McDermott said Jones will miss the rest of the season after breaking his arm in Thursday's loss to the Jets, The Buffalo News reports. Analysis: Jones had been a consistent contributor on special teams for the Bills throughout the season. 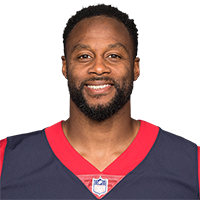 He was the victim of some bad luck Thursday when teammate Shamarko Thomas dove onto him while attempting to recover an onside kick, fracturing Jones' arm in the process. 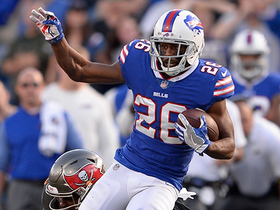 The Bills will likely sign a free-agent running back prior to their next game Week 10 against the Saints to add depth behind LeSean McCoy and Mike Tolbert, the lone other healthy running backs on the roster. Jones is out for the rest of Thursday's contest against the Jets with an arm injury. Analysis: Jones was injured during an onside kick attempt and was carted to the locker room with his arm in an air cast. With Brandon Tate out, Jones returned kicks for most of Thursday's game. 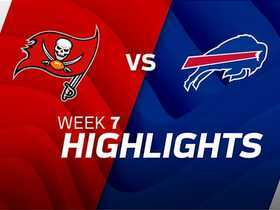 Watch the best plays from the week 7 matchup between the Tampa Bay Buccaneers and Buffalo Bills. Buffalo Bills running back Taiwan Jones runs for 11 yards. 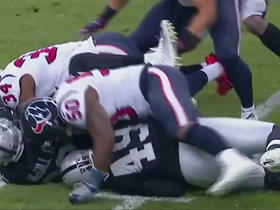 Oakland Raiders running back Taiwan Jones jukes defenders and picks up 15 yards. 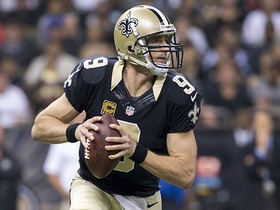 The "NFL Total Access" crew counts down the top 10 performance moments from Week 8. Find out who made number one. 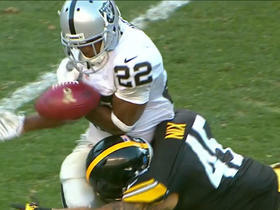 See who made the best run in Week 8 according to NFL Now's Ike Taylor and Maurice Jones-Drew. 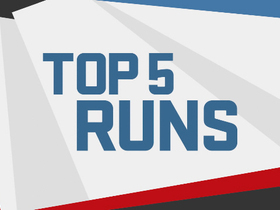 St. Louis Rams running back Todd Gurley broke loose for a huge 71-yard touchdown run, but was it good enough to be this week's top run?